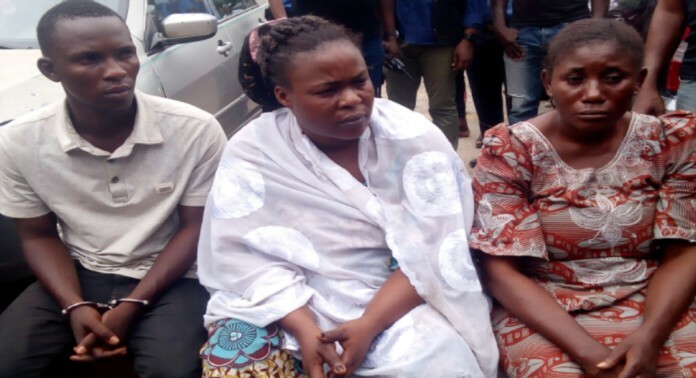 The Police in Lagos has arrested a 45-year-old housewife, Hadijat Kabir for allegedly arranging her own kidnap in order to defraud her husband of N15million. Muraino Kabir of Governor’s Road, Ikotun reported at the Ikotun Police Station that his wife and 18-year-old daughter, Hamidat Kemi, who is of unsound mind were, kidnapped on their way to Psychiatric Hospital, Oshodi, Lagos. The kidnappers reportedly demanded the sum of N15m before the hostages would be released. An investigation by the Lagos State Police Command revealed that the kidnappers were making their demands from a community in Ogun State, called Ado-Odo, Ado –Odo Ota LGA. The operatives of the squad mobilised to the area and busted the camp of the kidnappers. Following the operation, the hostages were rescued while some of the suspects were arrested. Others are still at large. The case is still under investigation with a view to arresting the fleeing suspects.